My name is Andrea Andrews and I love to teach swimming. What I am teaching in the pool has changed for the better over the years through experience and by syllabus changes allowing me to place a much stronger emphasis on play, fun and enjoyment of the water. The influence of technology on my job has also grown over the years having the use of online CPD, smart phones to talk to my clients every spare minute, twitter, linked in, Facebook and now I take my registers on an iPad that is protected inside a water proof case when I work for GLL/Better at Didcot Wave. I have been using this handheld device for about 12 weeks now and enjoyably it has its advantages, removing the necessity for soggy paper records or the expense of me laminating these same sheets myself and using waterproof marker pens. At first I found it difficult to transfer all of the details I already possessed about the children’s progress onto the device as there was a lot to enter in the short window of time that the records are modifiable (the same day of the week as the class) and I had habitually recorded more stepped detail than the iPad form permits. I am adjusting to the new leaner system by carrying more detail in my head which may keep senility at bay and may soon wonder what I ever did without it. This is what happens in life. However, I would also like to consider what will come out of this routine electronic data collection. Parents are able to go online and see the status of their child’s progress. This is useful for them to see where their child is in the stage and saves pieces of paper being exchanged. It may not reduce the necessary exchanges of words between parents and teachers, so essential for calmer waters to be maintained. It should improve safety too where a child cannot enter the water without being present on the electronic register. The operator; GLL says that they find real time live registers a key benefit. In conditions where “the system is down” teachers revert to using paper again and I have not so far lost, dropped or drowned a device thankfully. The intrigued members of the public and the children enjoyed me asking “Anyone for pizza?” when I first started to take the register and now they have satisfied their curiosity we get can all get on with the lesson much faster. What interests me greatly however, are the statistical analyses that the operator may be able to ply on the large evolving data set that they will hold across their numerous sites. Patterns will presumably emerge that can inform the operators how to make improvements in their swim schools. What form any improvements will take and whether teachers will feel that they are empowered as part of a positive process is down to the skill of the operator and the practical accuracy of the interpretations they make. Bare statistics can hide or mislead in equal measure and I hope that operators will not become too dependent on this ready source, employ their newfound knowledge wisely, always follow up with objective on the ground researches and not ever be tempted to make speedy or financial justifications to throw any babes out with the backwash. I would love to see it used as a research tool to shine a light on why some children fail to feel like a swimmer or able to enjoy the water as this will define their future participation. Examples of how GLL plans to use data for the benefit of the customer include – intervention schemes should pupils be stuck on particular areas of the curriculum, eg a clinic on Breast stroke leg action, monitoring of ongoing assessments, talent identification schemes linked to pupils progression speed and age. So as a pioneering child of the Pac Man and space invaders age I am being dragged into the 21st century further every day. I never thought I would see the day that electronic records are used in swimming pools so as usual will be trying my best to keep up but will also keep an eye on the interests of the pupils we try so hard to help day in and day out. 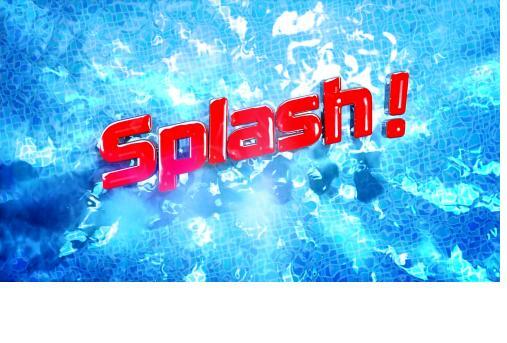 As the hit ITV show SPLASH! is set to return to our screens this coming January, RAPs member James Rankin shares his experiences about what it was like working on the location. In January this year I was fortunate enough to be working at a new multi-sports complex which was chosen by ITV to host a brand new TV series. SPLASH! is a reality television series that follows celebrities as they try to master the art of diving. During the series the celebrities performed each week in front of a panel of judges and a live audience in the Olympic-size diving pool at Inspire Sports Village. The result each week was partly determined by public vote. Gabby Logan and Vernon Kay presented the show whilst Team GB Olympic Bronze Medalist Tom Daley was the mentor to the celebrities. Launching earlier this year, the show certainly proved popular, averaging a weekly audience of 5.6m. The key area that really struck me in the preparations for filming was the in-depth risk assessments that needed to be carried out. Part of the show involved a stunt crew performing a routine from the diving boards involving some quite daring manoeuvres, including a bicycle coming off the 10m board! The TV company spent several days installing lighting, sound equipment and also a stage which actually sat across the width of pool to provide prime audience seating. This added a new dimension when assessing lifeguard positions and number of staff needed .The stage lighting affected how easy it was to view the pool and the equipment meant standard lifeguard positions were not always practical. Safety had to be paramount and before each live episode there was a rehearsal to iron out any issues and any necessary changes were made. Staff also needed to cover night shifts to ensure lifeguards were available for the TV crews working overnight preparing the sets at poolside. This is quite unusual in the leisure industry as not may pools open for 24hrs. The filming also had an impact on the rest of the centre as rooms were taken over for briefings, celebrity changing rooms and so on. This obviously caused some disruption to the day to day programme of the sports village and although the show was very popular and oversubscribed not all local residents were happy about the filming. This was mainly due to the two pools being out of use for three days on each weekend of filming. Some aqua sports clubs also had to make other arrangements. Overall I feel the use of the pool for filming was a positive experience for both the centre and my town. However to benefit customer relations if future events are planned, more consideration given to the local residents should be clearer, information of the timescales involved, and maybe priority tickets or an opportunity to meet the stars could be considered. However it was a good example of how sports and entertainment can work together. Having got into leisure through a part time lifeguard job in Bedfordshire, James then progressed to becoming a NPLQ TA. 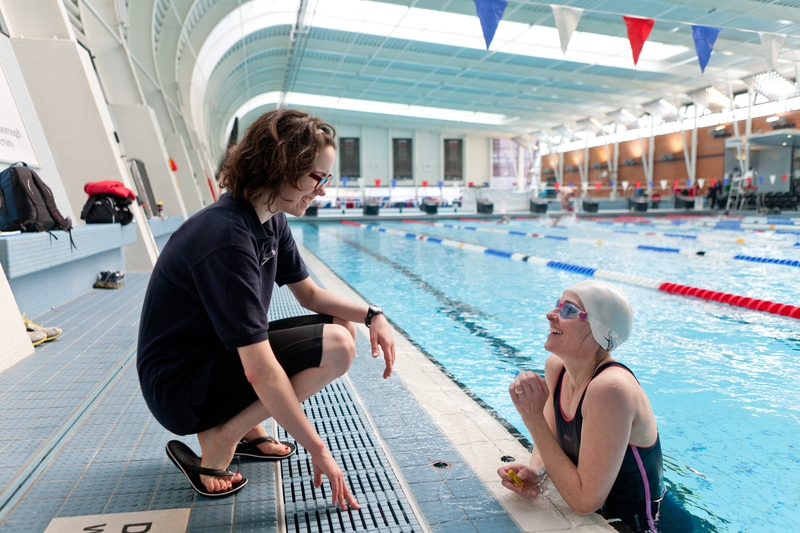 He qualified as a Level 2 swim teacher as well as gaining several other coaching qualifications in a variety of sports. Alongside his teaching James also has a solid knowledge of the legal and safety requirements needed to maintain high standards within the leisure industry and has undertaken Pool Plant operative courses as well as First Aid at work. Having qualified as a personal trainer, James is now setting up his own. In his spare time James enjoys many sports particularly wakeboarding and surfing. In my last blog you may remember I described some of the benefits that water aerobics can bring, I’d now like to share with you a few of the anecdotes that people have told me so far. I hope you’ll find them as amazing as I have. 30 years ago I broke my back in 3 places. Before starting water aerobics I would say that I only recovered to about 20% of my pre-accident state. I lived with severe back pain all the time. I could only walk for about 20 yards before I’d be in absolute agony and I couldn’t straighten my back. In August 2012, a group of friends decided to try a swimming and water aerobics class. I went to be sociable. I couldn’t imagine that when I started, that it would change my life! From doing hardly any exercise I have built up to 3-4 hours a week and feel I have recovered about 90% from the accident. My posture (sitting and standing) has improved; I can now stand straight, move around more easily and can now walk for 30 minutes without being in pain. I recently had to take time out and I noticed the difference– I was in pain and looked forward to going again so I could be pain free. My outlook is now positive instead of negative (if like me, you’re living with pain, you’ll know just how much it takes over your life). I have more energy, am happier and feel better within myself. Anne-Marie, 35, attends once a week. I suffered back and leg pain for around 7 years. I was diagnosed with right sided L4/5 disc prolapse with bilateral L5/S1 prolapses. The pain was debilitating and I was on strong medication. I had tried everything for it from epilepsy drugs to block nerve pain to painkillers (codeine, tramadol but then I became allergic to both so stopped taking them and had to live in pain). My doctor suggested swimming and I discovered water aerobics and it’s changed my life! In September 2012 I had microdiscectomy surgery. I went to water aerobics for about 6-8 weeks before surgery and my surgeon said that I had a fast recovery due to my strengthened core muscles and back! The surgeon was amazed how quickly I was back on my feet and back to work; it’s got to be down to the water aerobics! Water aerobics has definitely improved the quality of my life in a number of ways. I’m healthier than I have been in years. I’m a single Mum to a 10 year old daughter and I am able to do more with her now. My mobility has significantly improved and it’s helped to maintain my weight. I don’t take any medication whatsoever and my posture is much better. If I miss a session my back aches badly but when I go to the next session it helps to ease it again. I like to think that surgery took away the pain but water aerobics keeps it away. I’ve had lower back pain for about 5-6 years. It is a result of knee problems and has been aggravated by poor posture from working at a desk. I was hesitant to go as I couldn’t swim. Luckily I had a persuasive and persistent friend. When I first started going I was nervous for a while but over time I’ve gained enough confidence to start having swimming lessons. It’s amazing how free you feel in the water. I can do things in water that I can’t do on land e.g. lift my knee up to my chest. I’m walking so much better. Before my back problem, I used to think nothing of walking 1.5 miles to work. Then my back flared up and I started walking with a stick and relying on lifts to get around. Since starting water aerobics, I’ve got rid of the stick and I’m walking comfortably for 30 minutes. It’s not just me that has noticed a difference. My friends have commented that I’m walking so much better and that my posture has changed. Health professionals have also commented. I recently developed bursitis on my hip, the physiotherapist was surprised at how quickly it improved. I’ve found that water aerobics helps to loosen me up and I can do little things like make the bed. It has given me back my mobility and makes me feel human again. It’s good fun and as well helping with my joints I think it’s helped improved my state of mind and I’ve toned up as my clothes are looser on me. With daylight savings now in full swing, we are all at the mercy of the long nights and short days. Staying motivated over this period of the year can be difficult for all of us, especially those who are up early in the morning, working in or taking part in sport. Swimming is one of the few sports where an early morning is often required for training; this means someone has to open the pool at an ungodly hour to make sure our athletes get the best possible preparation for their competitions. In the winter months we tend to sleep more, eat more, see people less, leaving our body clocks in a mess and with the inevitable possibility of weight gain. So here are our five tips for keeping you healthy over the winter months. 1. For people who are prone to the winter blues, try light therapy. Exposure to bright light, especially upon waking up, has some major positive effects that can relieve winter depression. 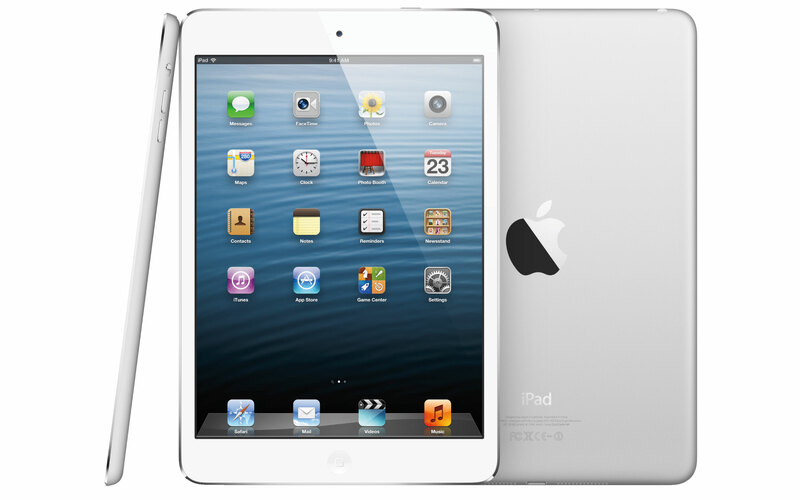 “It keeps the circadian clock in check, preventing it from drifting later than your desired, or workday, sleep period. It’s an energizer that gives a morning boost, whether you’re depressed or just sluggish. And it has direct antidepressant properties, stimulating the same neurotransmitters as antidepressant medications”. Special types of lights are required; it’s not enough to flick on your bedside lamp. A visit to a therapist who specializes in this treatment is also recommended, although light boxes can be purchased without a prescription. Terman’s website has a questionnaire to help you determine the best time of day to use light therapy, based on how much of a morning or night person you are. If you are prone to depression and are already using light therapy, he suggests skipping your usual dose this Sunday to help your body adjust to the new time schedule, and then resuming afterward at the same hour you used it previously. Even if depression doesn’t have a seasonal pattern, research shows that light therapy can help: it has been found useful for treating bipolar depression, depression during pregnancy and chronic depression. For more information about light therapy click here. 2. Whilst it may seem fairly obvious eating a healthy balanced diet is key to combating those winter blues. Not only will a healthy diet boost your mood, it will also give you more energy and stop you putting on weight over winter. Balance your craving for carbohydrates, such as pasta and potatoes, with plenty of fresh fruit and vegetables. 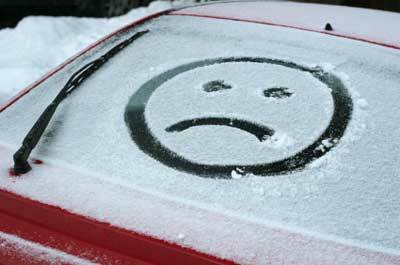 Experts from the Seasonal Affective Disorder Association also suggest taking extra vitamin D over the winter months. For more information on a balanced diet visit NHS Choices website for some great advice. 3. Why not try a new activity to get the whole family involved? As a break from the pool use the winter months to discover a new hobby, perhaps go ice skating, or take a bracing winter walk in the country or along the beach. Regular exercise helps to control your weight, boost your immune system and is a great way to break the tension that can build if the family is constantly cooped up inside the house. 4. Don’t forget your friends and family. Having that extra social support during what can be a gloomy few months can be some times exactly what you to lift you out of a winter funk. Something as simple as a phone call or a chat over coffee can brighten your mood. 5. Get creative with your fitness routine. As we know physical exercise is a great way to beat the blues as it releases mood-boosting endorphins and will also leave you looking great, but let’s face it many find their workout routine takes a hit when the cold weather sets in. To stay inspired to exercise through the winter why not see what new classes are happening in your local gym or swimming pool, or trying pushing yourself a little outside of your usual comfort zone.